Due to some health issues I had earlier in the year, I have read twice the number of books that I have reviewed. Here are my reviews of trade paperbacks volumes 17 through 22. 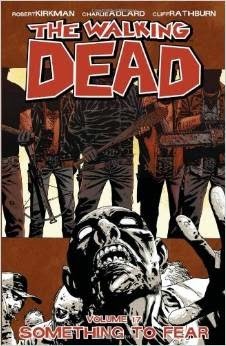 Rick and his group forge an alliance with the Hilltop Colony. The alliance leads Rick into a conflict with the colony’s enemies-the Saviors. Based on the way Rick has handled other groups in the recent past, he takes them on thinking they are a small, unorganized group. It proves to be a devastating error in judgment. Rick finds himself outmaneuvered at every turn by Negan (the leader of the Saviors). Negan is a classic opponent for Rick. He is drawn somewhat cartoony but his language and actions are far from laughable. Rick’s overconfidence leads to some tragic losses for his team. Negan and the Saviors are better organized for a battle than Rick. The sense of dread builds as Negan counters every one of Rick’s plans. 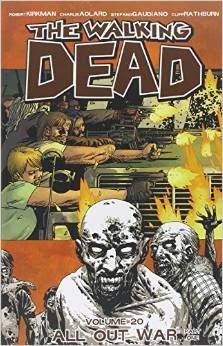 Although some critics became disappointed with this series, I think it has continued to be one of the best books on the market. And sales are supporting my opinion. It continues to be one of the top sellers month in/month out. 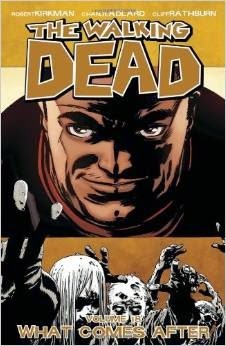 Living under Negan’s rules is leading to a slow death for the Alexandria colony led by Rick. 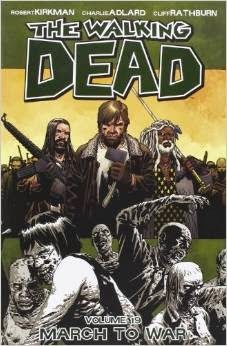 Rick’s ally from the previous arc, Jesus, leads him to another group called the Kingdom. The Kingdom is led by a man named Ezekiel who has a pet tiger. Ezekiel is not what he appears to be and that will lead to problems in the future. The main theme this time is Rick trying to learn who he can trust when he is going up against someone, Negan, who has anticipated his every move. Rick has to give the appearance of being humbled while making his plans. The unfortunate part is that some of his people, including his son Carl, are starting to lose faith. This collection is similar to a slowly cooking stew. At some point it will reach the boiling point but the reader is not sure when it will happen. Rick’s alliances are solidified with Jesus and Ezekiel. Final plans are formulated for the battle to take out Negan and the Saviors. Things seem to be working smoothly until Negan shows up at the Alexandria colony for his tribute. To say things go bad at this point is an understatement. I was afraid that after the Governor, Kirkman would struggle to find a suitable opponent for Rick. Negan is a perfect counterpoint to Rick. He is physically stronger and seems to be even more devious than Rick. The wildcard in this story is Dwight. He appears to be working undercover for Rick in Negan’s camp but enough hints are dropped to make you unsure as to his true intentions. Kirkman does an excellent job of keeping the reader doubtful of Dwight’s true allegiance. And the way Negan has out smarted Rick adds to that suspense. Rick leads his army( consisting of the Hilltop,the Kingdom, and the Alexandria colony) in an attack on Sanctuary (Negan’s base). Staying true to form for Kirkman, Rick experiences success at the beginning. Then Negan counter-attacks and things go from bad to worse. The creative team deserves kudos for their work on the “All-Out War” arc. It appeared bi-weekly. The only way the artist was able to keep up was with the addition of an inker. The inker made the art look even better. Kirkman has a gift of convincing the reader that events are going smoothly for Rick and then pulling the rug out from under him. The ebb and flow of the battle gave the feel that this is a real war. Negan’s counter-attack destroys Alexandria’s defenses and Rick is forced to confront him face to face. I do not want to reveal more because the events need to be experienced as you read the book. I was sure what was going to happen in the confrontation and Kirkman managed to surprise me. Some critics have complained about the ending but I thought it was an excellent twist. “All-Out War”, like most of the arcs in this series, left me emotionally drained. Rush out, buy this series, and read it. I cannot recommend it highly enough. 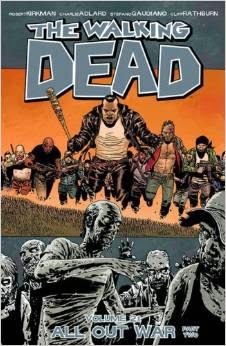 Kirkman skips the story ahead two years. The society is being rebuilt after the damage done during the war. A new group of survivors arrives in Alexandria. I want to keep this spoiler free so I will not use names. One of the characters is going down a dark path that could lead to disaster. Another is like a ticking time bomb. I cannot praise Kirkman enough for his character development. The new group is very reminiscent of Rick’s group from earlier in the series. They are very suspicious and are sure that the Alexandria colony is too good to be true. This is a great twist that allows us to see how Rick’s group from the past would react to the new status quo. It is a good way to give readers the best of both worlds. And the discover by the new group is something that could potentially destroy all the progress the survivors of the war have made.